Well another JWOC has come and gone and it was a blast! First, a big thanks to Brian Graham and Stefan Bergstrom for helping out. So looking back at the races, I figured I could share some of my insight into what went well and what needs some improvement. Starting on the first day of JWOC, we had the brutal long, 9.9 km with 620 meters of climb! The race was far from even being good. Small avoidable mistakes early on continued into catastrophic route choices and many other problems. 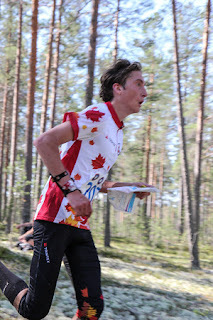 On the physical side of the race, I don’t think any of the Canadian men were prepared for the insane amount of climb. To say I was disappointed at the end of my race would be an understatement. I had been super psyched for this race and having an underwhelming performance was a blow to my confidence. Following the long we had the middle qualifier and middle final. First, congratulations to Alex and all the girls for making the B-Final! While doing some race analysis on the middle qualifier I realized how close I was to making the B-Final. One mistake on a relatively easy control cost me far to much time. However, trying to stay optimistic here, I managed to orienteer through the rest of the course without any mistakes! During the Middle Final I had a bit of deja vu from the Middle Qualifier. I lost tremendous amounts of time on one control but was able to refocus afterwards. 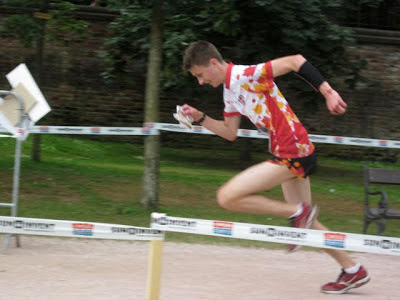 Looking back at both my middle races I was happy with my performances. I was able to follow my goals throughout the race and physically push myself even though it was very technical. Our last individual race was the sprint which was in downtown Hradec Kralove. I think everyone was surprised at how technical the race ended up being. We started in a garden with an intricate path network before heading over to the staircases where a majority of the race took place. Technical right from the start! I was surprisingly happy with my sprint. It is not a discipline we get a lot of practice up here in Whitehorse and I felt that I performed above my sprint standard. It was also exciting to see New Zealand and Belarus receive bronze medals! So finally we come to one of the most exciting races of the week, the relay. We all knew that the relay terrain was very difficult due to lack of strong features. In other words there was no contour detail and all we had to navigate by was vegetation and a trail network. 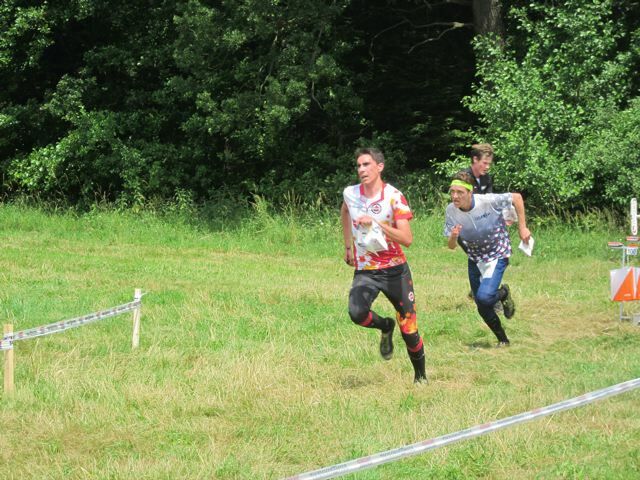 Adam was the first leg runner, he had a stellar performance and tagged off to me not far behind some of the big teams. What started out as a relatively okay race quickly turned into me running around like a chicken without a head. I lost time simple controls and was never able to truly refocus back onto my race. I truly feel that I should have been a lot more focused on my race and my goals because it wasn't just my name on that result. 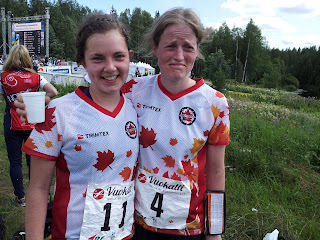 Now that you have read about all my up's and down's during JWOC it is time to look at what really needs improvement and how I am going to do that before next year. On the positive side it was an incredible learning experience. 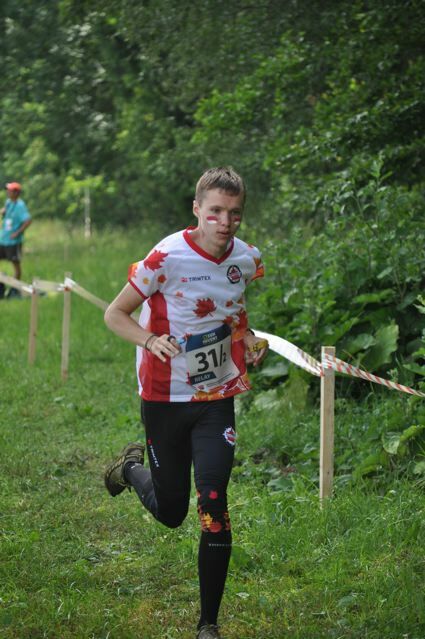 Not only was it great being on new terrain but every time you race at a big competition you learn about your habits as a competitor and how those affect your orienteering. Again thanks to everyone who helped out at JWOC and congratulations to all the other athletes at JWOC and WOC! WOC 2013 has come to an end. The last competition was the relay on Saturday afternoon. Friday evening after our team meeting, the whole team went down to a table by the lake to celebrate Robbie's birthday and relax before the final race. After our celebration, Toni attended Azerbaijan night (a mixer hosted by the new IOF country Azerbaijan). 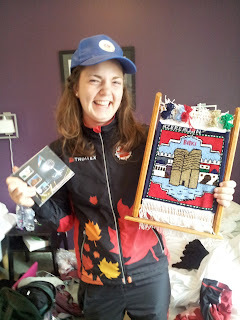 The head of the Azerbaijani Orienteering Federation gave some souvenirs to Emily for helping him practice his English. Team Canada was fairly happy with its relay results. Will ran the mass start for the men but had difficulties on the 2nd control and lost the pack. He made up a considerable amount of time and places in the later part of the race. Eric was especially happy with his solid race after his disaster in the middle qualification. 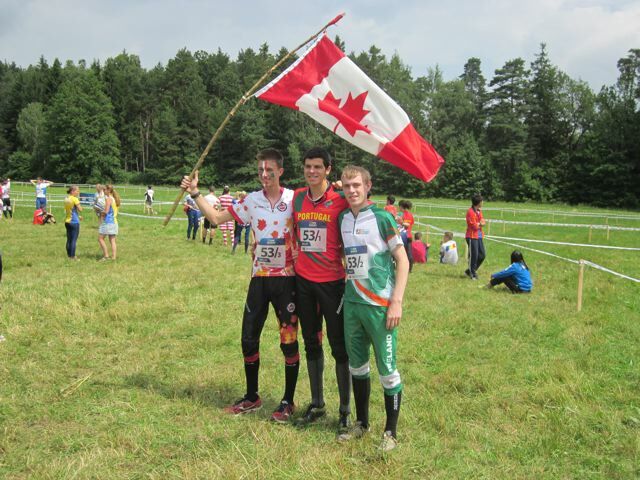 The Canadian Men finished 25th, 3 places higher than last year. Both Emily and Louise were satisfied with their relay runs. 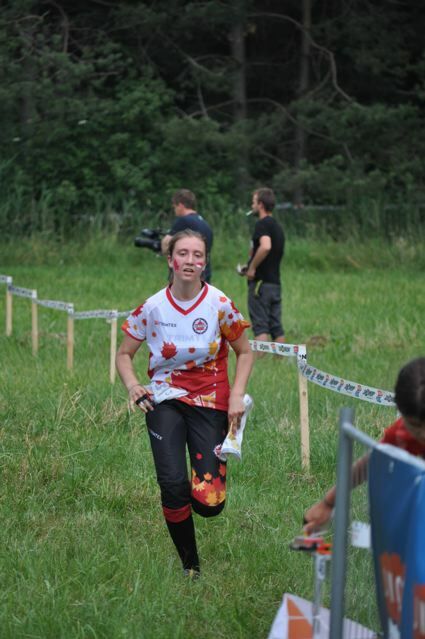 Kerstin ran the anchor for Team Canada and accidentally took her control description holder with control descriptions from the middle distance race even though the control descriptions for the relay are only on the map. She was fine for the first few controls but when she reached number 4 she checked the descriptions on her arm and saw that the codes didn't match. She relocated to the control twice before realising her mistake. She was disappointed that such a small thing ended up losing her so much time. The team assured her that it was a learning experience and that it was a mistake she was unlikely to make twice. The women finished in 20th position. 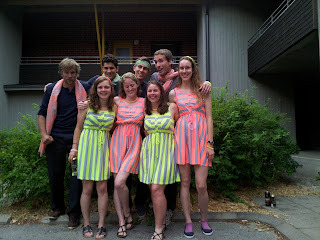 With the relay over, the team unwound at the WOC banquet before heading their separate ways on Sunday morning. 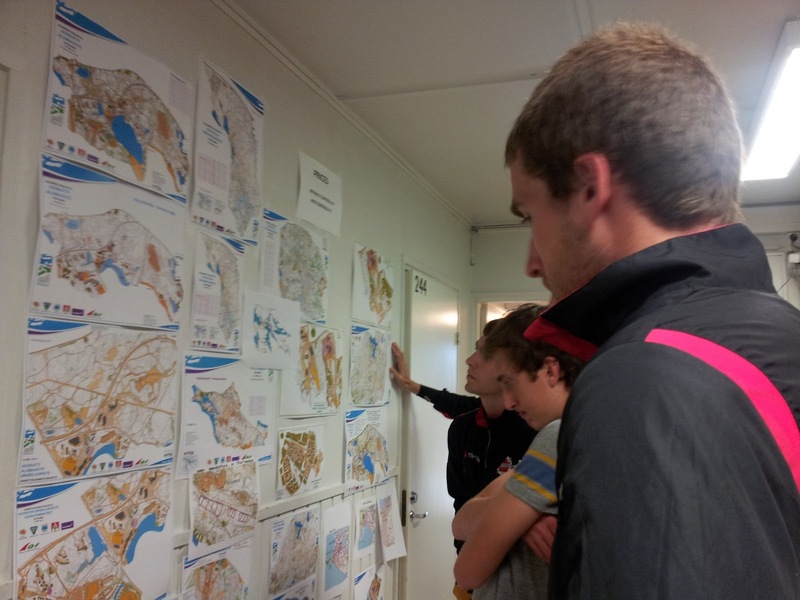 WOC 2013 was a tightly run ship with all events, trainings and accommodations close by. Many of the team members have said that this was their favourite WOC in terms of organisation. Thank you to the organisers. 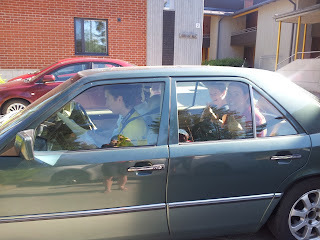 We would return to Vuokatti any time! 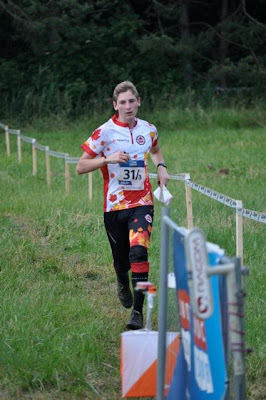 Friday was the Middle Distance Final at the World Orienteering Championships. For the first time this WOC, the women ran later than the men. So while Louise, Emily and Coach Toni waited in quarantine, team leader Meghan enjoyed spectating the Men's competition from right below the giant screen. The men's competition was exciting to watch with the Russian, Leonid Novikov taking a surprise victory over Thierry Gueorgiou by just 9 seconds. Sitting at dinner with team Canada discussed where they watched Novikov's victory. Toni heard about it in the quarantine, Meghan watched it on the big screen, Eric saw it on the tv at the event centre and Valentin Novikov (Leonid's older brother and 16th place in the middle final) was in the shower! Louise focused on navigation in her race because although the terrain was slightly less technical than in the middle qualification, it still had low visibility and small hard-to-read details. 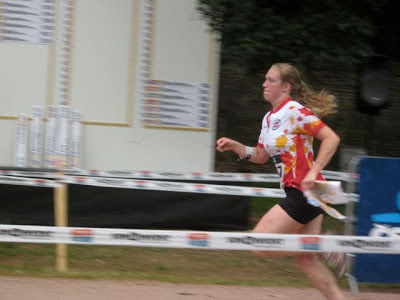 She was generally happy with her race but wishes that she could have trusted her navigation while running faster. Emily quite enjoyed the technical aspects of the course but found attacking controls on cliffs from above a tricky maneuver. She bobbled a few controls but avoided any major catastrophes. Louise placed 41st and Emily placed 26th just 2 seconds out of 25th! The men go first with Will running the mass start. Robbie will run the second leg and Eric will anchor. Emily will start off the women followed by Louise and Kerstin. 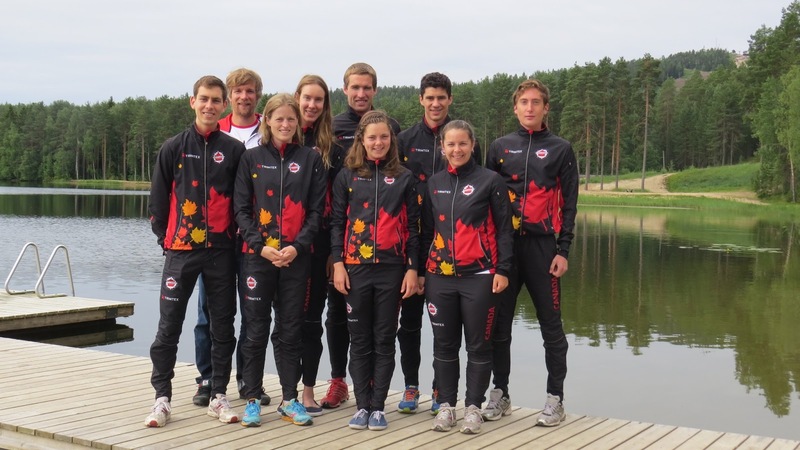 Team Canada is focusing on having good, technically strong performances more than results. 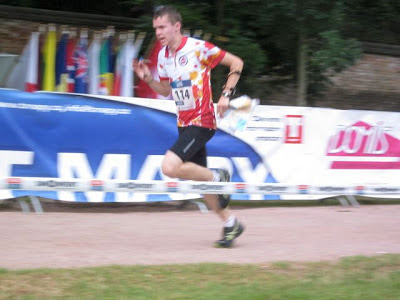 The Middle Distance Qualification at the 2013 World Orienteering Championships was tricky. Most of the runners left at least a few small squiggles in their gps tracks, some ran off the map and several strong orienteers did not manage to qualify for the final. All of the Canadian women managed to get through their courses without too many mistakes, although they all admit that they had some tense moments. Despite the distraction of another competitor asking her where she was, Louise qualified for the final in 11th place. Emily had a solid race, finished with a smile on her face and qualified for the final in 8th place, only 3:22 behind the leader in her heat. Kerstin made a few small mistakes but was only 3 spots out of qualifying in her heat! The Canadian men did not have as much success as the women in the Middle Qualifier, but the men have to contend with tighter qualification windows and a larger start field. Serghei found the slash on the ground a little too pointy for his liking and was not able to run at full speed through it. Will had some good sections of his race and some not so good sections as well. At control number two he picked up a shadow who followed him for the rest of the race mistakes and all. Eric felt prepared on the start line but did not have a clear plan for the end of the first leg and turned too early before the control. He was not able to recover quickly and took 28 minutes to find the first control. 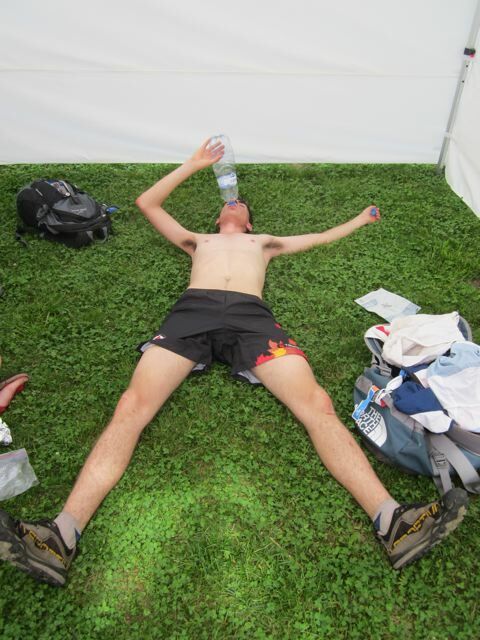 Instead of giving up and heading home, Eric soldiered on and finished the rest of the course. That is gumption! 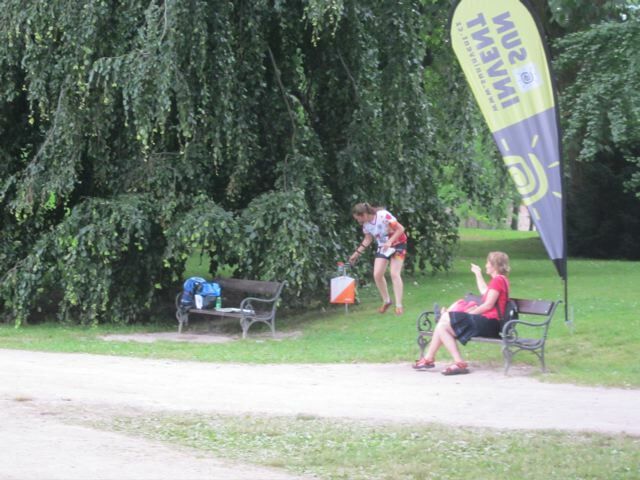 After the competition, Louise, Kerstin and Meghan relaxed with a little bit of Trail-O. They borrowed a couple of maps from the trail-oers down the hall and headed out for a new experience. It was tougher than expected and they still aren't entirely sure what the correct answers are but it was an interesting exercise. 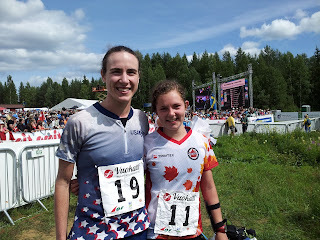 Tomorrow, Louise and Emily race the last individual race of WOC 2013, the middle final. The terrain is technical so anything could happen! 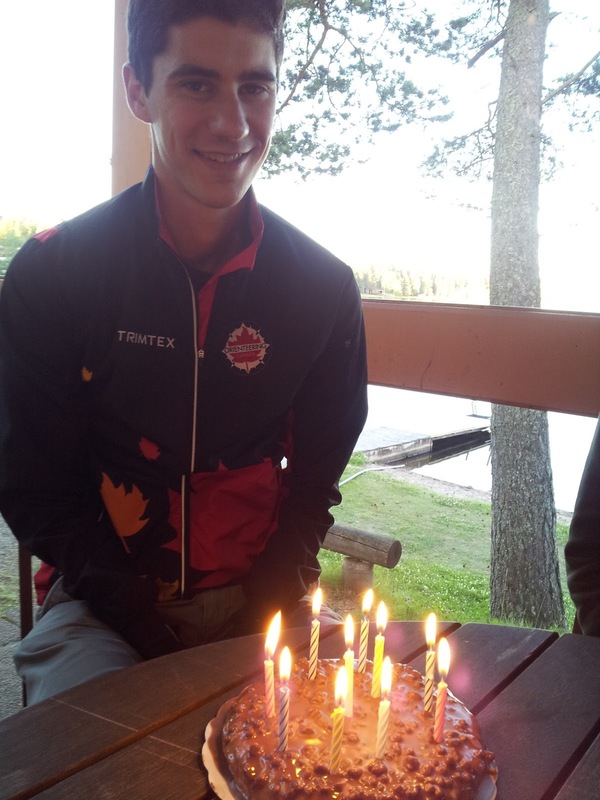 Monday was not Canada's day at the World Championships in Finland. 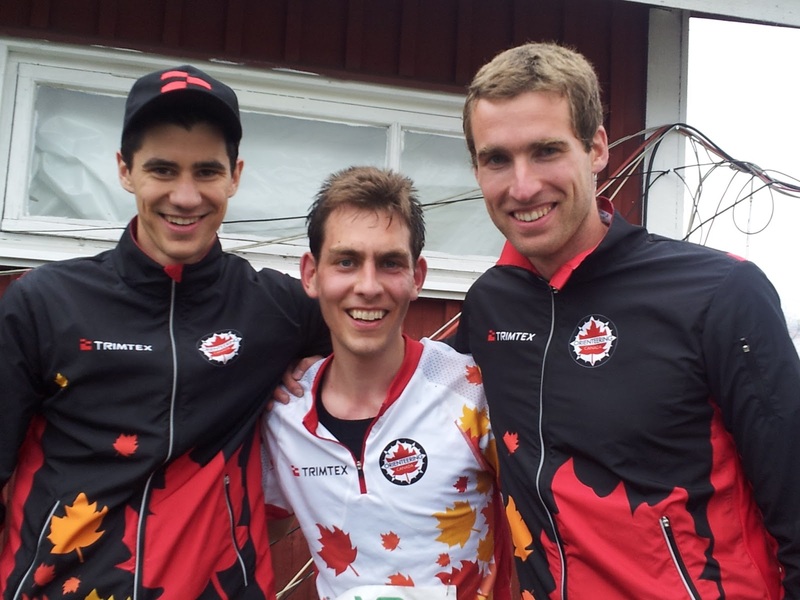 Serghei Logvin, Robbie Anderson, Will Critchley and Kerstin Burnett raced the Sprint Qualification. The top 15 in each of 3 heats advanced to the Sprint Final in the evening. None of the athletes had the races that they wanted. Both Serghei and Robbie were tired from the Long Distance Qualifier the day before and could not find the speed in their legs necessary to make the final. 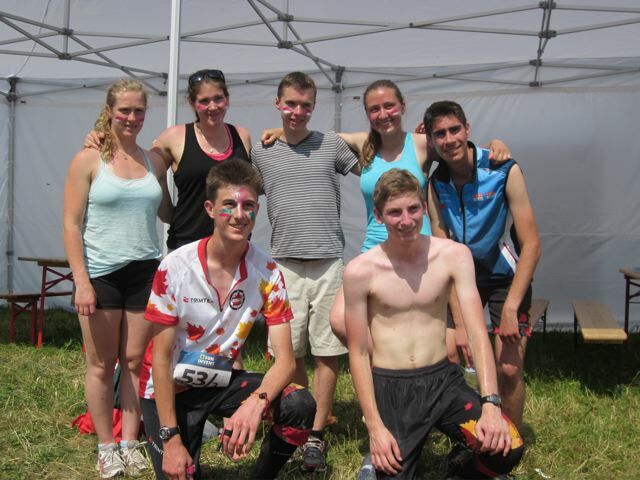 Both Kerstin and Will had good races but mispunched. There were many controls close together in a small area of houses that all looked the same making the course very tricky. "So, Will, how do you think your race went today?" Will was particularly angry because he would have qualified for the final without his mispunch. 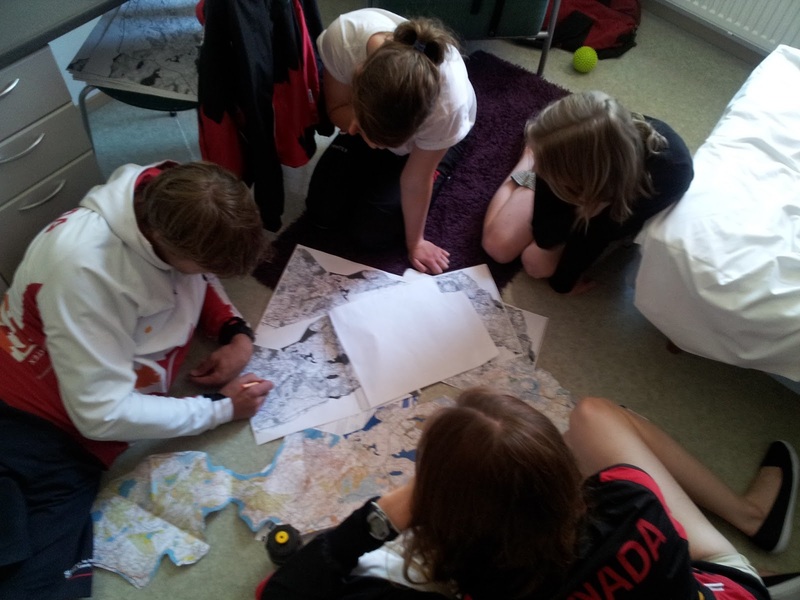 Louise and Emily spent the day studying maps and resting up for the Long Distance Final on Tuesday. 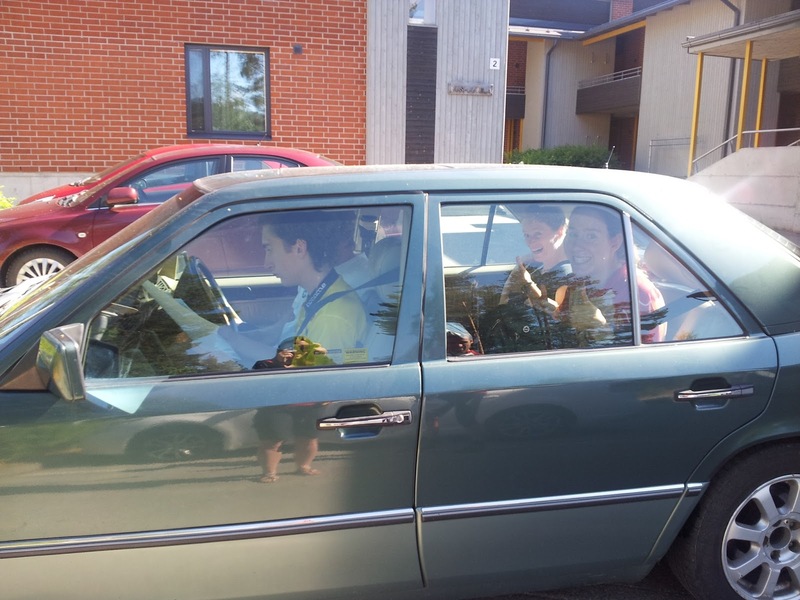 In the evening, the team headed to the opening ceremonies and sprint final in the nearby town of Sotkamo. 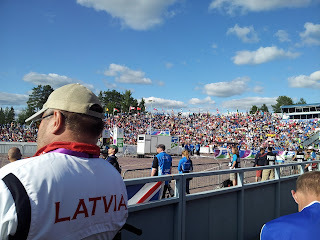 The arena was a full to the brim Finnish baseball (Pesäpallo) stadium. The sprint final was action packed. 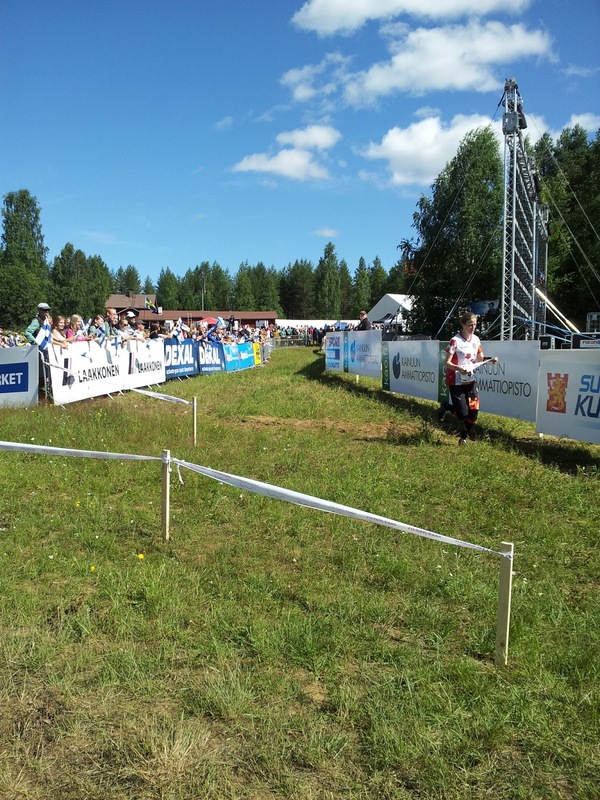 The organisers did a great job of turning the sleepy holiday village of Sotkamo into a challenging sprint with 47 temporary fences. The crowd was ecstatic when Finn Marten Bostrom took the gold medal in the men's race. Team Canada coach was ecstatic when the British team he had coached for the last few years managed three top 10 finishes including a silver medal for Scott Fraser. 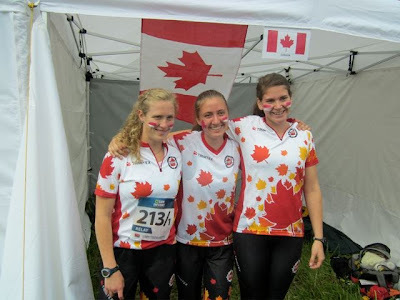 Both Louise and Emily raced the Long Distance Final Tuesday. 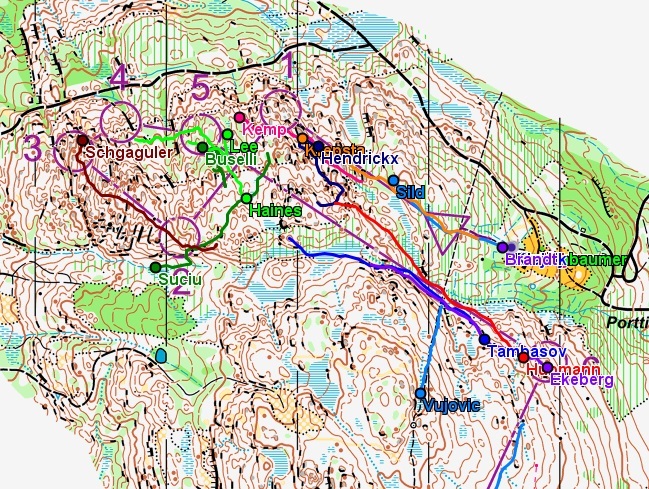 The women's course started in the arena, sent the runners out into the forest with long route choice legs, passed them back through the arena for a map exchange/spectator leg/ coaching zone, returned to the woods for a second loop and finished in the arena. 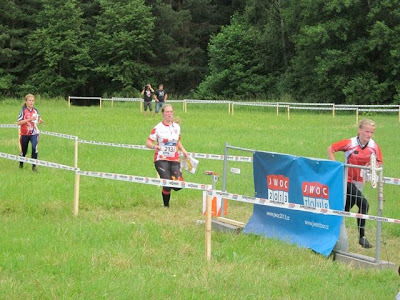 Louise made an error on the long leg between controls 1 and 2 and continued to lose time through out the race. She finished 43rd. Emily was much happier with her race. She was high up the leader board at the first intermediate control and managed to cross the finish line with a huge grin on her face. She finished 25th. Both of them must now regroup for the Middle Distance Qualification on Thursday. The 30th World Orienteering Championships kicked off today in Vuokatti, Finland. Canada was represented in the Long Distance final by Serghei Logvin, Kerstin Burnett, Louise Oram, Eric Kemp, Emily Kemp and Robbie Anderson. The courses were long and physically difficult and almost all the athletes said that they felt more tired than expected for the speed they were travelling. The long leg between controls 4 and 5 on the men's course and the same leg on the women's course was critical in most people's races. All of the Canadians lost time on the route choice with some ending up slogging through an exhausting marsh. The optimal route is still being debated. 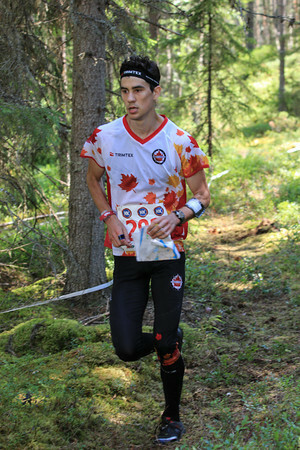 Serghei was the first Canadian finisher with Kerstin finishing soon after. 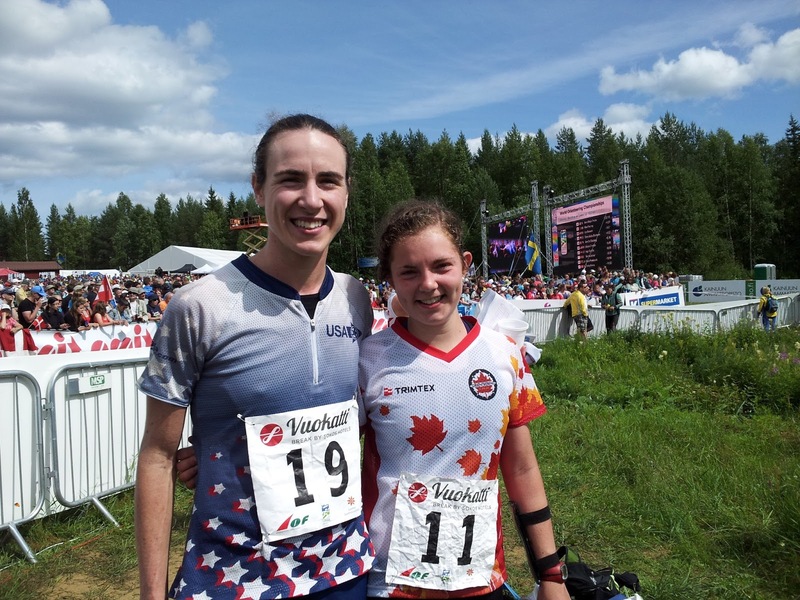 It was the first time at WOC for both Serghei (22nd place Men's Q3) and Kerstin (21st place Women's Q3). Louise had a solid race but was unsure of her choice on the long leg. She was surprised that her route took her through a series chicken coops. She was generally pleased with her race and waited anxiously to see if her result would be good enough to qualify for the long final. Emily said that she was surprised how exhausted she felt in the forest and how uncomfortable it was to push herself physically. She is looking forward to a rest day tomorrow. Both Emily (12th place Women's Q2) and Louise (14th place Women's Q1) qualified for the Long Final on Tuesday. Eric found the race very demanding and ended up in 27th place in Men's Q1. Robbie (24th Men's Q2) started in the late start block. He knew that the qualifying would be tight. After losing time to 5 he knew that his chances were probably gone and found it difficult to push to the end. Serghei, Kerstin and Robbie (as well as a fresh Will) will have to recover mentally and physically from the long distance before the sprint qualifier first thing tomorrow morning. 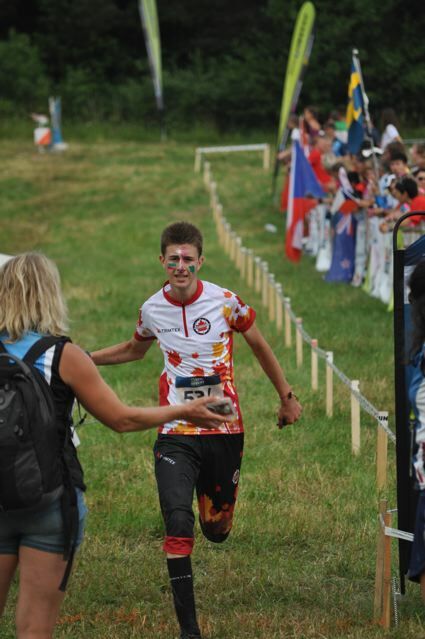 The JWOC 2013 is over, finishing with an exciting relay where top teams mis-punched left, right, and centre and in the end the Czech Teams were on the top of the podium in both women's and men's events. 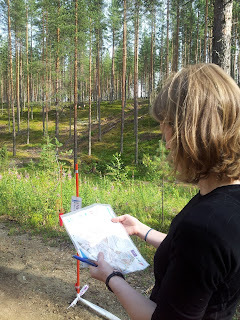 The relay was run in a mostly flat area with lots of vegetation features and diffuse and difficult orienteering. Kendra had a fantastic race ending up in 11th place on the first leg, only 1:10 behind the leader. This was definitely the best Canadian performance all week. Adam had a very good start and was in the lead pack at the first couple of radio controls and still around 16 place at the spectator control, but then lost time on a couple of controls in the last loop, ending up in 35 place around 8 min behind. Pia and Jen both had problems and lost time and the team ended up in 38th place. Trevor and Alex also had some problems with the vegetation features and lost time compared to Adam and the team ended up in 41st place. 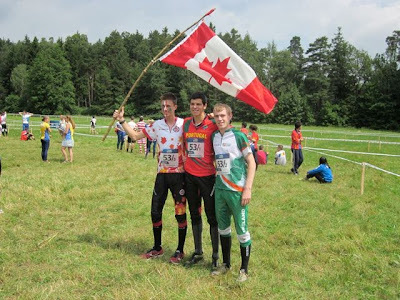 Congratulations to everyone on the Canadian Team for a their hard effort against tough competition and in unfamiliar terrain. Now it is time to start training for next year's JWOC in Bulgaria. 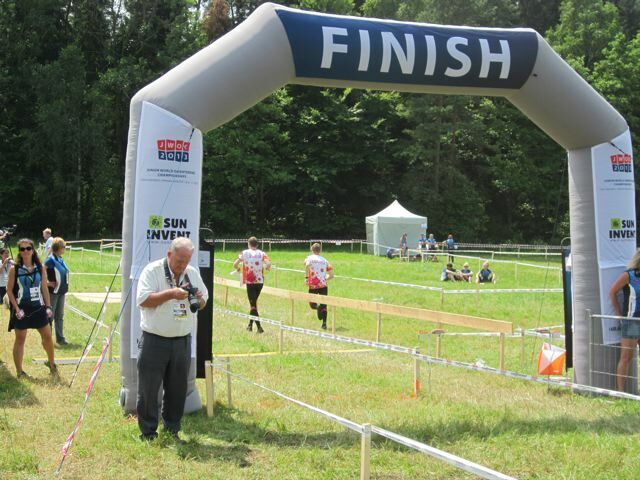 The week has been very well organized, with interesting and challenging terrain, good maps and courses, and a fantastic arena production with big screen video and results, and GPS and TV broadcast. A big Thank You to the organizers in Hradec Kralove. A big Orienteering Canada shout out and thank you to Stefan Bergstrom for his tireless work over the past 9 months preparing the logistics for our athletes at JWOC. His role cannot be understated, and his efforts are much appreciated. Thanks to Brian Graham for stepping in at the last minute as Coach. Having an experienced voice to guide and prepare the athletes for races is so important. Also a shout out to Junior HPP coach Brent Langbakk. Brent has done a fantastic job this year arranging individual coaches for each junior athlete in the HPP, giving coaching advice, and lending his expertise to build a great junior program Canada can be proud of. Get well soon, Brent! The excitement continues tomorrow with the World Orienteering Championships in Finland. We'll keep you posted here, so tune in and support our athletes! The startlists, results and live results service with splittimes are included in the competition monitoring services free of charge. All links will be on the woc2013.fi -site on the competition monitoring pages. 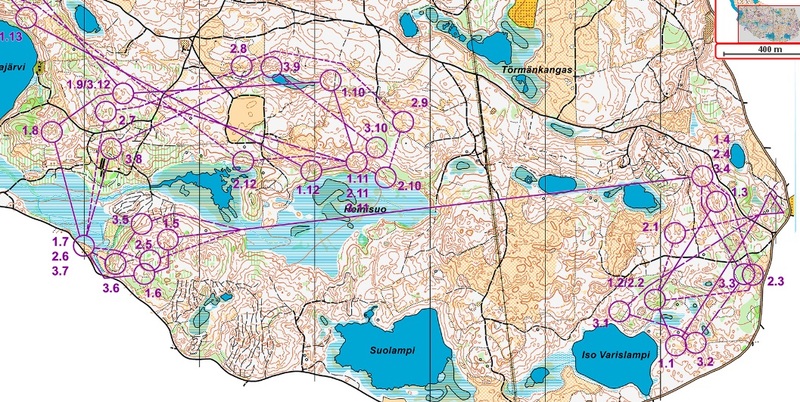 All competitions except for women’s Long Distance qualifications will have GPS tracking. 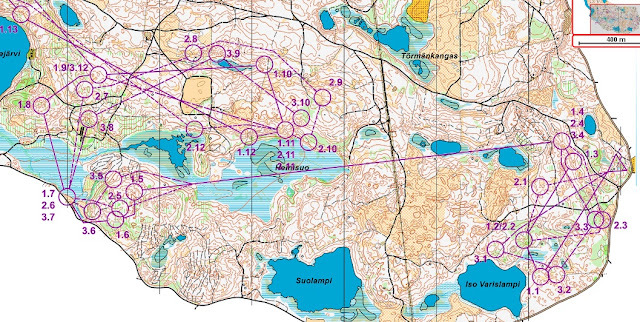 GPS tracking is available on woc2013.fi -site through the competition monitoring pages. For the Relay, the GPS tracking will happen live only during a part of the TV broadcasts. Afterwards, the GPS tracking of the Relay will be available completely. The GPS tracking is a paid service. The charge for the entire week is 10 Euros, and with it you can follow the GPS tracking, the video production of the organisers as well as the commentaries online. You can get the service by paying the fee online with your credit card. The actual TV production will be supplemented by the organisers’ own video production. The video production contains the field interviews and competition shooting during the qualifications in a smaller scale. The media events and award ceremonies will also be filmed. Between the competitions, edited bits of the general ambience will be shown. 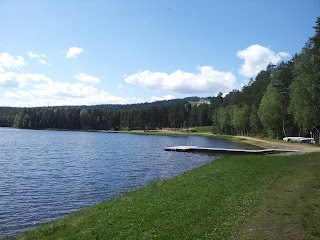 Organisers’ own video production will be seen on the 2ndscreen as well as on the woc2013.fi -webpage in the competition monitoring service. WOC will be followed actively in social media. 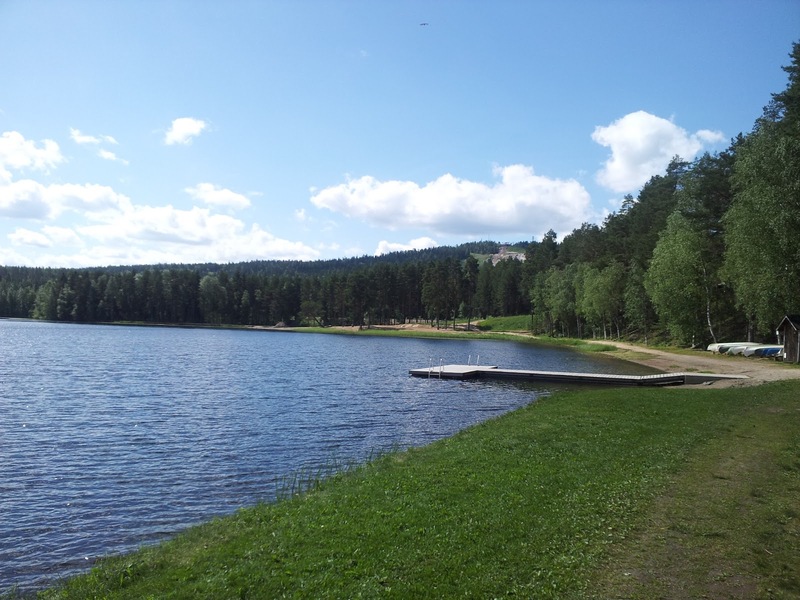 Twitter (woc2013vuokatti) and Facebook (woc2013vuokatti) are transmitting results, athletes’ comments and pictures of the WOC week’s events. 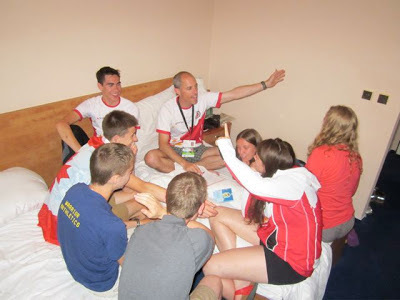 During the competitions, a traditional WOC chat can be found on the woc2013.fi -page supplementing the social media, where the orienteering folk can talk about the WOC’s turns of events. We will be updating the blog and tweeting regularly throughout the week so check back every day! 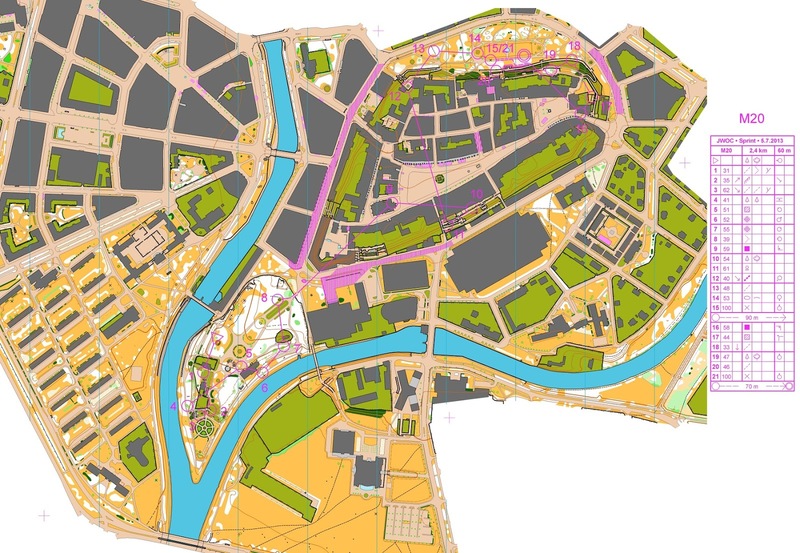 If there's one event that's a whole pile of fun in old European cities, it's the sprint. Trying to navigate little passageways, stairs, crazy dead-ends, and multiple levels at top speed will keep even the best orienteers on their toes! Today's sprint did not disappoint! The courses started in a park area, then climbed up in the old town with legs up and down lots of stairs and terraces on the steep slope of the old fortifications. This is the men's course ~ check out 11 to 12. You need to know your sprint symbols to help with this one! 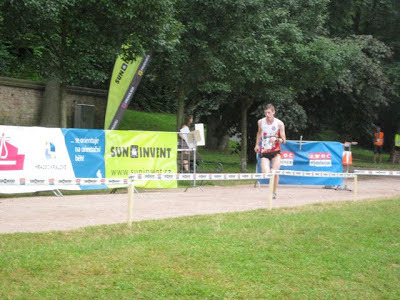 On the men's side, Adam Woods had the best result of the day, 3mins 37secs back from the winner in 130th place. Training on all those sprint maps in Vancouver has obviously been paying off (Sprint Camp in February, everyone!!) 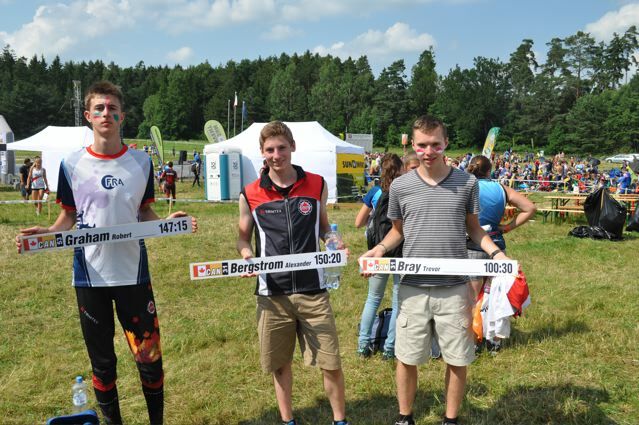 Alex did a great job in 139th; Trevor was 147th, and Robbie finished in 160th. 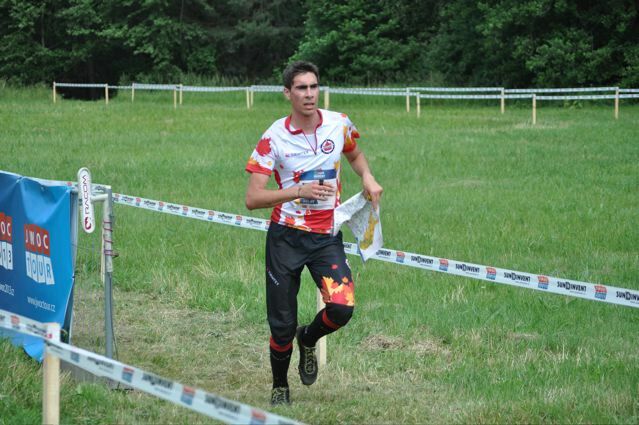 Alex in the finish chute. On the women's side, Kendra ran a solid race to finish 3mins 10 secs back from the winner in 88th place. Pia was in 113th, and Jen finished in 135th. 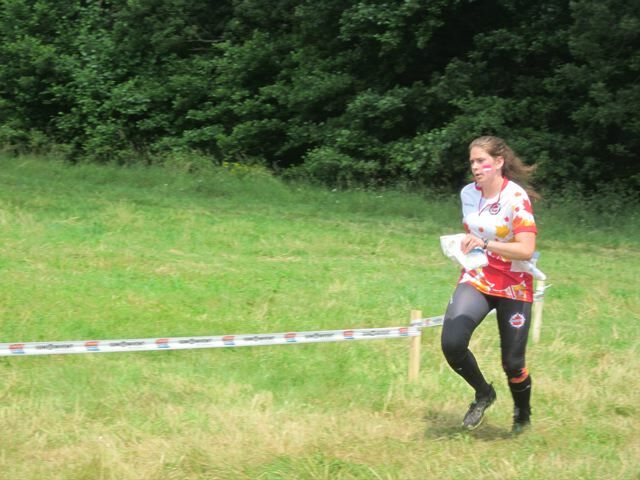 Kendra looking very strong in the finish chute. 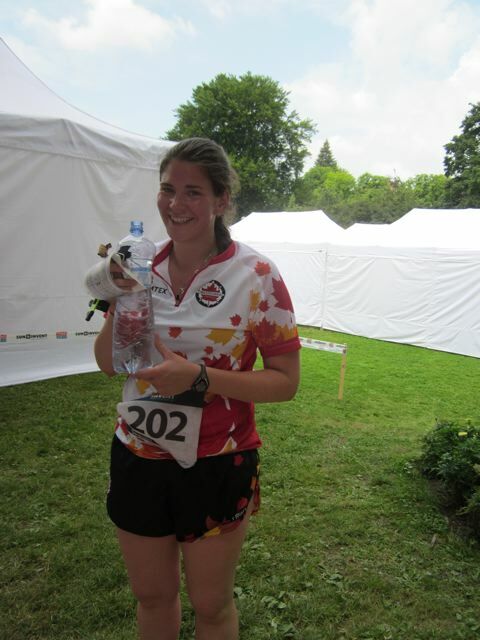 Jen at the finish, happy with her race! 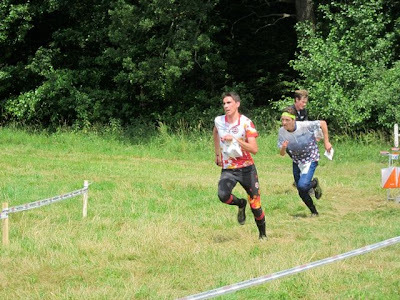 Robbie sprinting to the finish. Trevor running so fast, the camera couldn't catch him in focus! You can view the full results, splits, maps, and GPS tracks for the women at http://www.jwoc2013.cz/ The GPS tracks are always fun to play with - you can select which runners you want to see, do a mass start to see which routes were faster, and so on. Team meeting for the relay tomorrow. 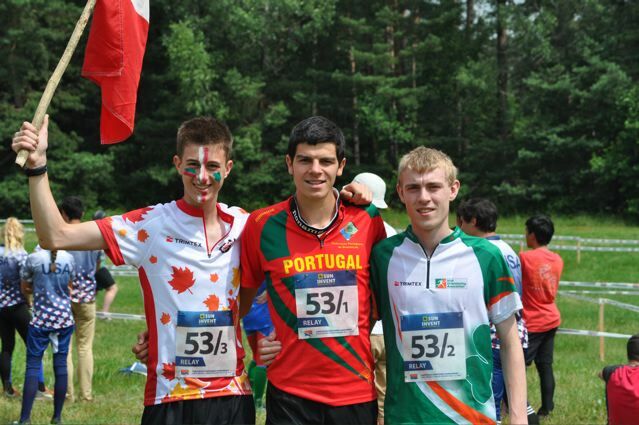 Robbie is running leg 3 with Rafael Miguel (Portugal) and Niall McCarthey (Ireland). All teams should have GPS tracking, so make sure you tuned in for the women's race at 4am EDT (that's 1am PDT), and the men start at 6am EDT (or 3am PDT). 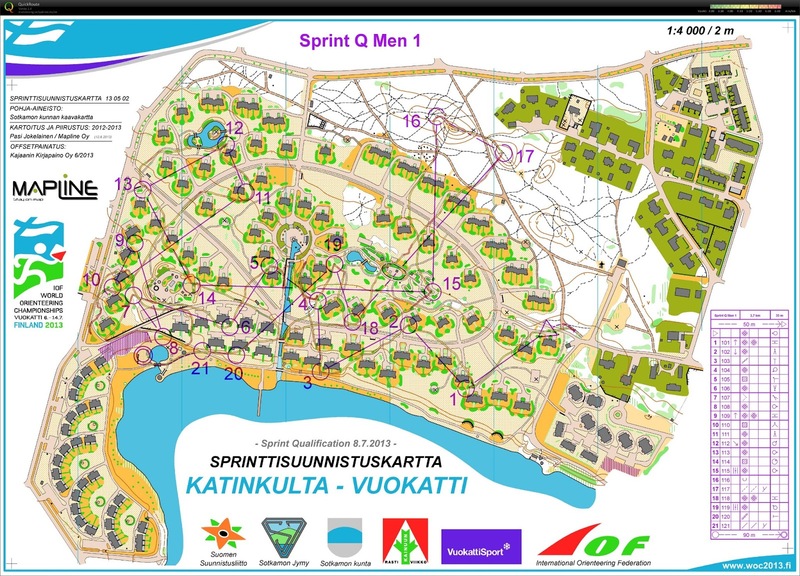 The World Orienteering Champs start this Sunday in Vuokatti, Finland. 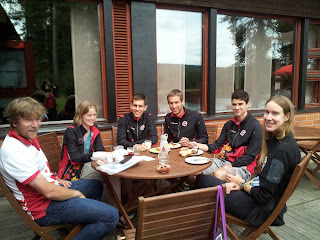 Team Canada has been on the ground training and preparing for their races for the past several days. 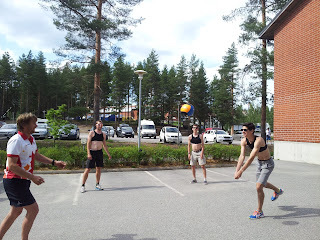 When we aren't training in awesome (but slightly buggy) forest, studying maps or playing catching features, we have been swimming, playing volleyball and learning how to use the Finnish sauna. The event centre and accommodation are at Vuokatti Sports Institute, a high performance training centre and sports holiday getaway. We never have to go far to find a good map. Tomorrow, the official model events start. We will keep you posted as we get ready for Sunday's long distance qualifier!